These are really tasty and full of so much natural flavour! 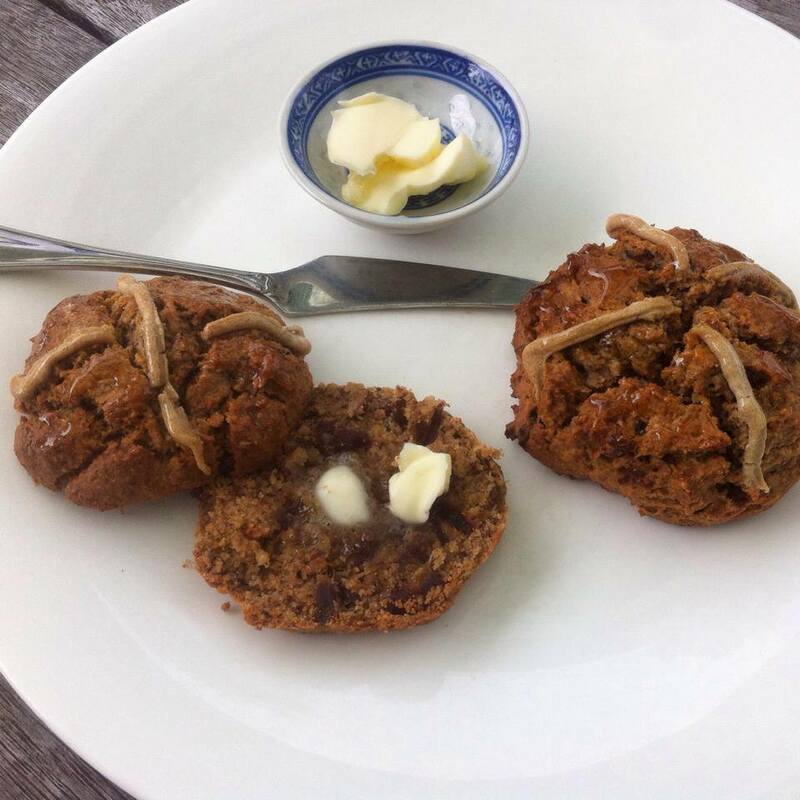 While they don’t have the consistency of traditional hot cross buns (they are a bit more dense and have more of a scone or muffin texture), they still taste darn good, so give them a try! These buns taste best on the day they are baked as they go a bit hard the next day. They will keep for a few days though and are delicious warmed up in the toaster with a bit of butter or coconut oil spread on them. Sift the buckwheat flour, almond meal, tapioca flour, baking powder, cinnamon and nutmeg into a large bowl and stir until well combined. In a separate bowl, whisk the coconut oil, coconut milk, eggs, ginger, honey, vanilla, orange juice and zest until combined. Pour the mixture onto the flour mixture; stir it through with a knife until the mixture is well combined. Stir in the dates and apricots, still using the knife to mix. The mixture should be evenly combined by this point and have quite a thick-wet consistency. Line a baking tray. Take ice cream scoop sized parts of the mixture and pop them on the tray so they form a round shape. I found using an actual ice cream scoop covered in coconut oil worked well for this, as the mixture is quite sticky. 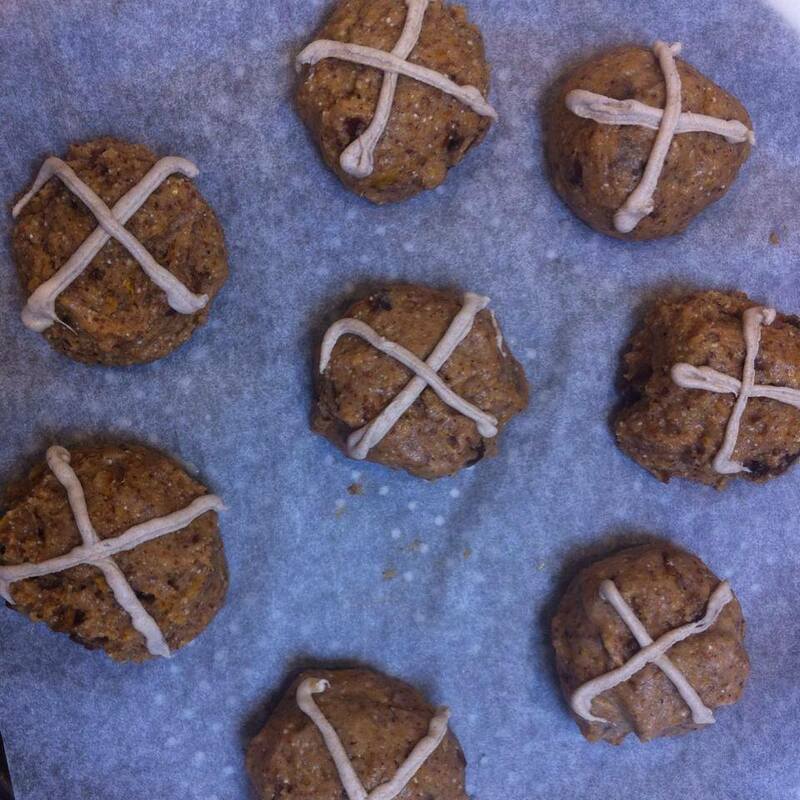 To make the mixture for the cross, mix the buckwheat flour with the water until it forms a sloppy-like dough. Using a plastic bag, spoon the mixture into one of the corners of the bag, cut a small hole in the corner of the bag the mixture is in and pipe it over all the buns to make a cross. Place the buns in the oven for 20-25 minutes, until they are golden and a fork comes out clean. Leave to cool for half an hour. Then they’ll be ready to eat!